Intense pulsed light (IPL) is a highly advanced technology that uses a broad spectrum of light waves to rejuvenate the skin. With IPL, our plastic surgeons can treat signs of sun damage, symptoms of aging, rosacea, acne, vascular lesions, and unwanted hair. The powerful rejuvenating capacity of the broad-spectrum light in IPL treatments makes it possible to effectively treat an extensive range of skin conditions. Patients who choose to undergo IPL treatments can look forward to having noticeably younger, healthier, and clearer skin. These skin concerns will usually be found on the face, neck, chest, and hands, but they may be located anywhere on the body. Candidates for IPL treatments will want to improve their skin and may desire a proven treatment that does not have a lengthy recovery period like many skin rejuvenation treatments do. IPL treatments are tailored to each patient’s needs and are safe for all age groups and skin types. After selecting the precise settings for the patient’s needs, the surgeon delivers gentle pulses of IPL to the treatment area. The treatment utilizes a broad spectrum of visible light to simultaneously target multiple skin conditions. Contact cooling before, during, and after the light pulses helps the patient remain comfortable during the treatment. 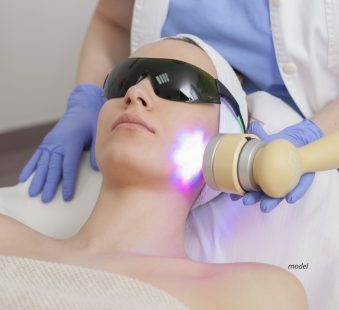 The IPL selectively destroys vascular lesions, age spots, unwanted hair, and other damaged or irregular skin tissue while stimulating a natural repair and collagen-building reaction to improve skin quality and health. After just 15 to 30 minutes, the photorejuvenation session is complete. A series of treatments is recommended for the best results. IPL treatments have minimal to no downtime and discomfort afterward. Initially, after an IPL treatment, the skin may look flushed, brown spots may appear darker, and capillaries may be more visible. These changes will fade away after a few hours up to a few days and should not prevent patients from being able to return to their normal daily activities as soon as they desire after their treatment. The results from IPL treatments are immediately visible and typically improve over time. The treated area will become softer, smoother, more even in tone, and more vibrant and youthful. IPL treatments can significantly improve the appearance of age spots, sun damage, fine lines, wrinkles, rosacea, melasma, hyperpigmentation, vascular lesions, and many other skin conditions. Ideal results can be achieved after a series of treatment sessions, with regular maintenance treatments recommended two to four times per year. The results of IPL tend to be highly consistent, making it an ideal treatment for patients with a wide variety of skin rejuvenation needs.